With the end of the regular season nearing and bowl season approaching, we pick our favorite players who won't have the opportunity the play in a bowl game. Each year, this week of football is like Christmas Eve: there's a ton of anticipation, and probably some good food, but ultimately you just want it to be morning. Thirty-two teams are playing either Friday or Saturday in exactly five games that have even a shred of playoff implications. Sure, there will be some fun meaningless matchups (let's hope so, at least), but on the whole, the first week of December is all about driving yourself crazy concocting the dozen or so scenarios that might play out. And that's if you're a fan of one of the maybe eight teams that has a chance at a playoff spot. For the rest of college football, this week is nothing more than a looming decision, which can often be reduced to a question the likes of: Will your favorite team play on the beach or in Shreveport? But there's an even less fortunate group: those fans whose schools couldn't pull together six wins to get bowl eligible. They'd like you to know that Shreveport seems delightful this time of year, thanks very much. For teams whose seasons ended last weekend, it's time to maybe hire a new coach, to certainly regroup and figure out what went wrong. But among all the losing, there are always standout players; some of them are a reason for hope next year, others a name to watch in the NFL draft. So here, as we pause and wait for the college football gods to unveil their grand and chaotic plan, let's acknowledge some of the best players to be finished too soon this fall, in no particular order. Mahomes's Red Raiders went 5–7 in 2016, finishing their season with a 54–35 win over Baylor that saw the quarterback throw for 586 yards and six touchdowns. Earlier this season, he logged 734 yards, a career high, against Oklahoma in a 66–59 shooutout loss, and on the year, he had 5,052 passing yards, completing 65.7% for his throws, for 41 touchdowns. It's hard to fault the quarterback for his team's unholy lack of defense that doomed its hope of a bowl berth (the Red Raiders allowed more average yards per game to their opponents than any team in the past 20 years but the 2015 Kansas squad that failed to win a game), but critics can cite the Big 12's overall inability to stop opposing offenses as an at least somewhat legitimate slight. Texas Tech's win against Baylor may have been Mahomes's final college game; he's draft eligible but has not yet shown his hand as to his decision for next year. Standing at 6' 3" and weighing 230 lbs., he has a huge arm and certainly an NFL future—he might even be the best quarterback in this year's class should he choose to leave—but will likely take time to adjust to defenses at the next level. In his introductory press conference, new Texas coach Tom Herman said one of his first priorities in Austin would be to speak with Foreman about his future. That's understandable; the junior is draft-eligible and finished 2016 with 2,028 yards, averaging 6.3 per carry, and 15 touchdowns. It was a breakout season for the running back, who logged 708 yards and five touchdowns in 10 games in 2015, but it'd be understandable if he did choose to turn pro. Careers are notoriously short at his position, and he took a beating in 2016, carrying the ball 323 times, the most of any player in FBS ball. Ricky Williams, the best rusher in Texas history, said on the Longhorn Network last week that Foreman is a better back than he was. That's almost certainly false. Still, Foreman had himself quite a season despite the Longhorns' 5–7 finish (although the Longhorns will qualify for a bowl if South Alabama or UL-Lafayette loses this weekend), and with numbers like his on a good team, he'd be a real Heisman contender. At 6' 1" and 250 lbs., he has the size and breakaway speed that should translate to the next level—and would certainly be a bonus for Herman in his first year at Texas should the junior choose to stick around. Jones—Zay is short for Isaiah, if you were curious—broke the NCAA record for single-season receptions last weekend, finishing his year with 158 catches for 1,746 yards and eight touchdowns. His team, though, fared worse, winning just three games to miss a bowl for its second straight year. Jones's 11.1 average yards per reception were fewer than any other player in the top 10 in total receiving yards this season, but if you're looking for a high-volume receiver, Jones is your guy. He averaged 145.5 yards per game, also tops in the FBS, and though it'd be hard to call him the best receiver in college football this season—Western Michigan's Corey Davis gets that not—he's certainly in the conversation for No. 2. 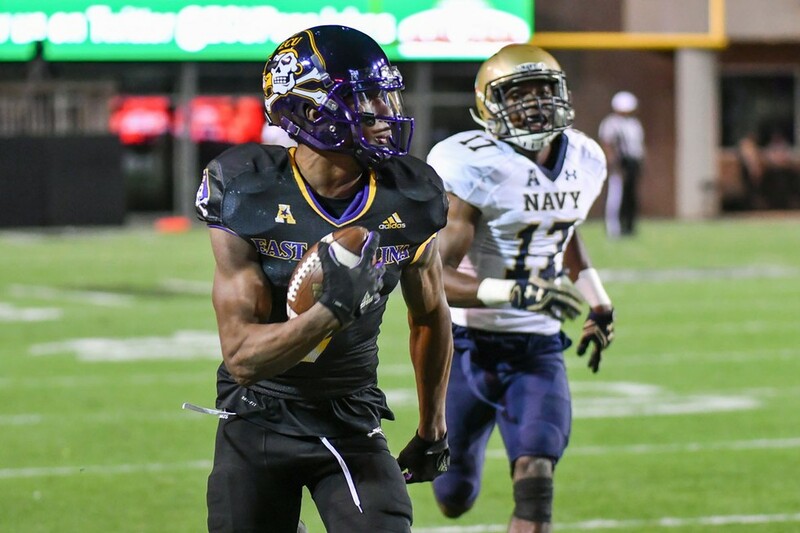 An East Carolina legacy, Jones wasn't even the best receiver in his family as a teenager. His older brother Cayleb played at Texas and Arizona, but it's the lightly recruited, slender (6' 1", 197 lbs.) younger brother who's left his mark on the record books. The Bruins' 2016 season certainly could have gone better—they lost to Cal last weekend to cap a 4–8 campaign—but McKinley, at least, will go out on a high note. A projected first-round NFL draft pick next spring, the defensive end finished his senior season at UCLA with 10 sacks and 61 tackles even after playing limited reps for the first three games of the season while suffering from a groin injury. McKinley is long, athletic and fast, a dynamic edge rusher who probably needs to put on some strength to be effective against the run in the NFL. At 6' 2" and 262 lbs., he has room to do so, and not getting to see him play in a bowl game may be the worst part about the Bruins' skid after losing quarterback Josh Rosen to a shoulder injury in October. Notre Dame, which finished 4–8, may be the most surprising team to have a player featured on this list, and if there's one member of the Fighting Irish we should all be saddest to wave goodbye to until next fall—be it in South Bend or the NFL—it's the quarterback. Kizer came out of nowhere a year ago after Malik Zaire's season-ending broken ankle, and this year, he won the job a second time. He showed some development in his second season as a starter, finishing with a 26:9 touchdown-to-interception ratio, compared with 2015's 21:10. He was slightly less accurate, completing 58.7% of his passes compared with 63.0 a year ago, and he slumped at the end of the season. In Notre Dame's final two games, he completed just 50.7% of his passes, and the Irish lost both. Early in 2016, Kizer seemed like a surefire first-round pick, but after Notre Dame's rollercoaster of a year, he may be wise to return for his senior season. He has the arm and body of a future NFL player, but his struggles indicated he might need more snaps at the college level to fully grasp the mental aspect of the game. The Irish have so much talent they earned two mentions on this list. McGlinchey, who plays left tackle for Notre Dame, will most likely be a first-round pick whenever he chooses to leave South Bend, be it this winter or next year. He's indicated he plans to return to college for a final season, and his transition from the right side of the line to the left hasn't been seamless, so another year at Notre Dame could help him firm up his draft status and secure a surefire first-round grade. Jones gained 1,827 yards this season for UTEP, good for third-best among FBS running backs. His 7.7 yards per carry are the most among all rushers who amassed more than 1,500 yards this season, and only six players scored more rushing touchdowns than he. Of course, it was all done on a smaller stage—UTEP's toughest opponents were Texas, Southern Miss and Rice, and the Miners finished 4–8—but the season Jones put together led him to ask the NFL College Advisory Committee for a draft grade. Jones missed most of last season with an ankle injury, earning a medical redshirt, and as a sophomore in 2014, he rushed for 1,374 yards, averaging 9.8 yards a carry, making this season anything but an aberration. At 5' 10" and 205 lbs., he is slight but plays fearlessly and seems to find holes that aren't evident until he's through them. He also plays with his twin brother, Alvin Jones, who's listed at an inch taller and 10 pounds heavier than his brother and is one of UTEP's starting linebackers.